Everhug Men's Running Track Pant 100% Polyester - Blue. 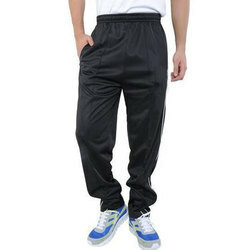 Carry a relaxed casual look with this cool and trendy pair of joggers from Spykar. A great pick for casual and sports wear, it features a waistband with contrast drawstring fastening, elasticated hems and cool pockets. As a quality focused firm, we are engaged in offering a high quality range of Casual Sports Lower.